I first met Josh Balk when we were seated next to each other at a leadership summit dinner for the Humane Society of the United States (HSUS) in Washington, DC, in 2015. Josh, a boyish redhead with a wide and welcoming smile, was wearing an HSUS staff name tag. We introduced ourselves before sitting down to listen to US Senator Cory Booker, a fantastic orator and animal welfare advocate, speak to a room filled with HSUS volunteers. 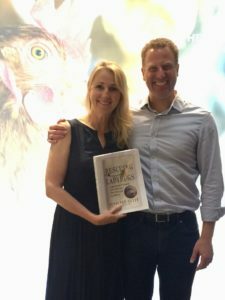 It wasn’t until the next day, when we were working together on a Massachusetts ballot initiative to end the extreme confinement of calves, pigs, and egg-laying hens, that I discovered this young man in his midthirties was, in his own right, a world leader in the social justice movement for animals. As vice president of farm animal protection for HSUS, he is credited with negotiating groundbreaking deals with food companies to better the lives of farm animals. He is also an entrepreneurial golden boy, having cofounded the food technology company JUST (originally called Hampton Creek). Like many people who’ve chosen a career path advocating for animals, Josh was an empathic child and was especially affected by animal suffering. After high school, driven by a steadfast sense of right and wrong concerning animals and their treatment, Josh aligned himself with like-minded people. While attending George Washington University in Washington, DC, he interned with HSUS and later became a volunteer. Advocacy turned to activism in 2002 when Josh accepted a job with the nonprofit Compassion Over Killing. During his time at the organization, he worked undercover in a chicken slaughter plant owned by Perdue Farms. He was twenty-five years old. I still remember my first day on the job. My shift was early morning, so it was before sunrise. The ride to work was cold and dark. I parked in the lot, walked into this decrepit building, and found my way to the locker room. I remember I was paralyzed with fear because there were a dozen or so workers there eating and getting changed and drinking coffee. I was sure they could see the hidden camera on me. Then the supervisor came in and motioned for us to get in the shackling room. We followed the supervisor in, and I got in line with the rest of the workers, all in front of the conveyor belt. The belt was waist-high and just above it were metal shackles. I heard a noise to my left. A truck pulled up, parked, and dropped an unrecognizable white mass on the belt. Then the belt started to creak and churn a little bit and move. The shackles began swinging, and I looked over again and saw the chickens approaching, piled on top of each other on the conveyor belt heading my way. I thought, Oh my God, this is actually happening! It was an experience I will never forget. It’s one thing to read about or watch the plight of farm animals. But nothing can match seeing the suffering and fear firsthand. Seeing this poor bird in pain for no fault of her own inspired me to fight on her behalf and the billions like her in the poultry industry. Josh’s work exposed cruelty to animals at the Perdue plant, and media coverage brought to light the abusive slaughter practices in the chicken industry. A year later, Josh transitioned into a role leading the corporate negotiation efforts for the farm animal department at HSUS. There are currently no federal laws that regulate the treatment of the nine billion animals raised for food in the United States each year inside factory farms. To circumvent the government’s passivity in protecting animals used for food, Josh was directed to eliminate the worst factory farming abuses by convincing companies to require higher standards of care for the animals used in their supply chain. He moved swiftly, leading a team that convinced hundreds of companies to adopt strict animal welfare policies. Threatened by his success, meat producers worked against him by strengthening their lobbying force in Washington. One lobbyist, Rick Berman, went as far as to create a Facebook page and website called “HumaneWatch,” which attacks HSUS and its staff, including Josh. Instead of embracing consumers’ cries for change, Berman tries to silence the good work of the organization. But the attacks have only served to strengthen Josh’s resolve. Most meat, eggs, and dairy come from factory farms where animals are raised in windowless sheds, provided no enrichments, and left to breathe an unhealthy amount of ammonia emanating from their own waste. In the United States alone, hundreds of millions of these poor animals are confined in tiny cages that prevent them from moving more than a few inches for their entire lives. As the human population increased and the standard diet included more meat, eggs, and dairy, there was a growing need for these products to be produced as cheaply as possible. As a result, small family-run farms have given way to factory farms that value the mass production of meat over the humane treatment of animals. Witnessing this inspired Josh to start a food company. In my work, I was being exposed to it all. The more I knew, the more it became clear that the animals needed us to be as strategic as possible during our finite time on earth if we really wanted to help them. I wanted to disrupt global factory farming, which represents the more than 90 percent of farm animals who we make suffer in the world. Aside from the transformational work I was a part of at HSUS, I thought that if I could form a company that produced plant-based foods that are affordable, marketed to the mainstream, and taste just as good as animal-based food, then I could make a further difference. I pitched my idea on the phone one night to my high school friend Josh Tetrick. He had wanted to start a company that was inherently good for animals and liked my idea. So we started building a team. We hired a chef, a head of research and development, and a person to lead sales. We impressed a venture capital team enough to get a half million dollars, and we got started. Hampton Creek — named after my late St. Bernard, Hampton, who was such a love for me — was formed. Our goal is to create the biggest company in the world that happens to be good for animals. Our values were to be innovative and aggressive, to go fast so I can have the biggest impact I possibly can in my lifetime. It’s a mentality that requires thinking about mortality. I’d hate to, in my last moments, think I could have made a bigger difference but didn’t give it a shot. If I was bold and acted with courage to take leaps, I think I could peacefully say good-bye to this world. In 2011, Josh Balk and Josh Tetrick cofounded Hampton Creek, later renamed JUST, when they were both thirty-two years old. Their products — which include egg substitutes, cookies, cookie doughs, mayos, salad dressings, and even “egg” patties — are made completely from plants. Their most popular product is Just Mayo, an egg-free mayonnaise. They started selling “clean meat” in 2018 — meat grown from a small cell sample; that is, meat that has never existed in animal form. The product is expected to change the world by eliminating factory farming and the subsequent need to slaughter animals. Proof that innovation can be rewarding, within three years of the company’s inception, the two Joshes had raised $120 million to fund their venture. Within four years of its founding, the company was valued at $1.1 billion. As vice president of farm animal protection at HSUS — his full-time job — Josh leads a team that has persuaded hundreds of companies — including Walmart, Kroger, Kraft Heinz, Starbucks, Aramark, and Supervalu — to adopt animal welfare policies that prohibit extreme confinement of animals raised for food. He’s also worked to pass laws ending the crate and cage confinement of calves, pigs, and chickens in a dozen states through successful ballot initiatives or legislative campaigns in state houses. According to Paul Shapiro, founder of Compassion over Killing and former vice president of policy at HSUS, there are more laws and corporate policies protecting farm animals than ever before, and more consumers are leaving animals off their plates and eating plant-based meals instead. This colossal shift is due to Josh and other leaders in the compassion movement who confront cruelty head-on, using common sense and innovation. By exposing a food system that is inherently bad for animals and the people who eat them, they’re creating positive change for everyone.